In the drugstore, when you’re in a hurry to pick up a bar of soap, you may throw it into your cart without looking at the ingredients. What you might not know is that some of the products you buy can have negative effects on you or your family’s health. The truth of the matter is that store shelves are lined with shampoos, moisturizers, deodorants and soaps that contain ingredients that could be harmful to your health. Take soaps, for instance. There are many ingredients used in the production of soap that don’t simply moisturize and make your skin feel clean and refreshed, they also poison the skin with unnecessary artificial additives. Let’s start with synthetic scents. Some soaps contain fragrances created with harmful chemicals that can lead to dry skin and irritation. A common ingredient found in many soaps is Triclosan. Triclosan is an aromatic compound with antibacterial, anti-fungal and antiviral properties that can potentially aggravate the skin. But perhaps the most dangerous ingredient added to some household soaps is Sodium Lauryl Sulfate, a chemical used to increase lather quality. Studies show that concentrations of SLS as low as 0.5% can cause irritations. Some soaps can have concentrations as high as 30%! 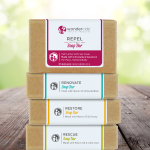 Instead of lathering up with a conventional soap bar full of questionable ingredients, you can keep your loved ones safe and clean with Wondercide’s natural soap bars. Our organic soap bars do not contain any harmful chemicals and are locally handcrafted in small batches from fragrant coconut oil and other high-quality essential plant oils, neem extracts and botanical ingredients. The result is an organic soap bar that will make sure skin feels totally clean and refreshed. 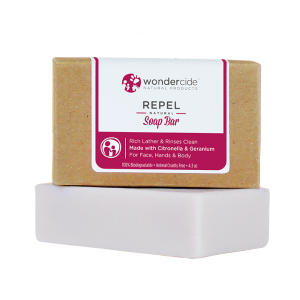 One of our best-selling organic soap bars, Repel, offers refreshing Citronella and Geranium scents that are perfect for your next outdoor camping trip to repel pests. Our organic soap bars are superb for routine dog baths and human baths. The natural ingredients will leave skin (and coats!) 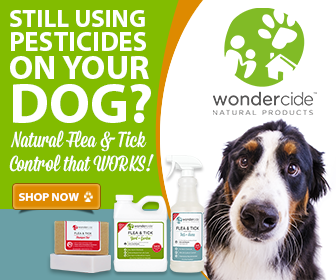 clean and soft and offer long-lasting protection against insect bites. Is Body Wash a Natural Soap? My wife has decided that we should look into using organic soap to wash with because it is better for our bodies. I didn’t realize that ingredients in regular soap don’t simply moisturize and make your skin feel clean and refreshed. I would like to be able to feel the soap doing it’s job, so it sounds like my wife was right in choosing to buy organic soap for our family to use in the future.